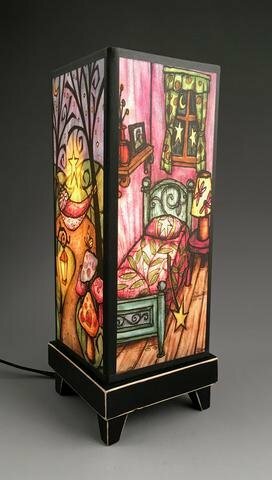 This is a good-mood lamp! It has a wood base that is painted, distressed, and coated to protect the finish. The shade is made from textured archival paper and printed with archival inks to last a lifetime. The top is open allowing ambient light upward and the shade is translucent to allow a warm glow. Each side is different, and shows an original design titled "Fairy House". The colors are rich and the imagery is magical. It makes a great accent lamp. In-line on/off switch on the cord. It measures 12" high with a 4.75" square base. No assembly required. Handmade in Wisconsin.